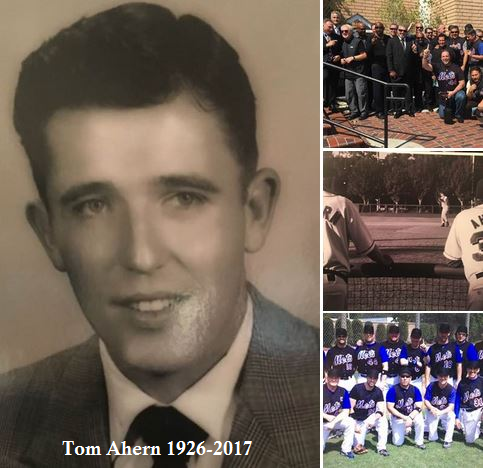 Today, my friend and teammate Tom Ahern was laid to rest. He was 91. He didn’t play for us on the field, his son Jeff does. But through the past 18 seasons we Valley Mets have developed an incredible bond with one another. Tom was the center of it all. He kept our scorebook and meticulously entered the stats for every game until his hand wouldn’t allow him to write anymore. But that didn’t stop Tom. He came perfectly suited up in his Uni to every game we played for 18 seasons. His presence in our dugout was a true inspiration for all of us players. Earlier this year, I had posted that this would have been my final season playing Hardball. Well after today, and by absolute DEMAND I announce the Valley Mets WILL BE BACK NEXT SEASON. To win one more L.A. Championship for Tom! We’re going to put together a very solid squad. 40+ Mets came to today’s service out of the 200+ people that came to pay honor to this beloved man. He received a Full Military burial. Saluting Marines, folded American Flag, Taps by a Bugler, the whole ShaBang. It was incredible and I couldn’t be more proud to be part of the genuine camaraderie that we all feel for one another within this baseball team. R.I.P. Pops! As my best pal Joe Barrett eulogized earlier, “May the road rise to meet you. May the wind be always at your back. May the sun shine warm upon your face. And until we meet again, may the Lord hold you in the palm of his hand!” Tom was laid to rest in his home white Mets Uniform…….. He indeed…went home.